The other morning a small mouse ran through my kitchen. We live in the woods, so mice are not out of the ordinary when winter rolls around. They have always had the decency to stay in the walls in the past, but last year they developed a boldness that drove me crazy. My oldest son invested the time and effort to bring a mousetrap into the house to catch the culprit. This morning we all learned a few lessons from the experience of setting the trap. 1. Rushing the job might result in injured fingers. The old fashioned snap traps can be triggered by the jolt of pushing them into place. Lesson for life: a hurried decision or a rushed job will most often result in mistakes or mishaps that require bandages and patches to recover. 2. Laughing at the pain felt by others only increases the pain. My husband could feel the giggle without even seeing me, but you have to confess that you would have been giggling at the “snap, ouch” that kept coming from the corner. Lesson for life: compassion helps to sooth the troubles – and if you must laugh you need to leave the room. 3. The sticker the substance the harder to let go. The experiment with a ball of bread failed (for us, not for the mouse) so the new bait is peanut butter. 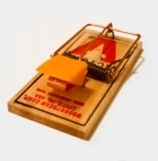 It will be sticky enough to make the mouse work for the treat but it also makes setting the trap that much harder. Lesson for life: when you have something in your life that sticks to you (material objects, jobs, or even habits) then those things posses you and dictate your walk. 4. A one man job may require more than one man. My husband and son worked together to get the trap baited and set. It was a team effort that was successful because of the encouragement and support they provided each other. Lesson for life: every challenge you face in life becomes easier with the support and comfort of a friend. Life lessons can be uncovered in the most unlikely place. A mouse running through the kitchen resulted in me remembering that hurts happen when I rush and comfort makes the job a little easier.